A professional sports bettor set the single day record on Jeopardy! 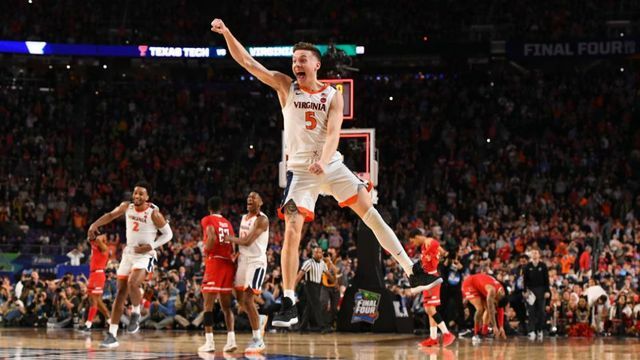 Virginia completed the ultimate redemption when they won the national championship earlier this week. Some sportsbooks opened them as favorites to repeat in 2020. The Masters started yesterday with Rory McIlroy entering as the favorite. McIlroy, a four-time major champion, has 7-1 odds to win his first Masters this week at Augusta National and complete the career Grand Slam. Dustin Johnson is 10-1, followed by Justin Rose (12-1) and Tiger Woods (14-1). Jordan Spieth, Justin Thomas, Rickie Fowler and Jon Rahm are each 16-1 at the SuperBook at Westgate Las Vegas. One bettor put even more money on Woods at the William Hill US sportsbooks on Tuesday afternoon, wagering $85,000 at those 14-1 odds. The bet would win $1.19 million and represents the largest liability on any individual golf wager in the company’s history. The AAF won’t finish its inaugural season, but FanDuel decided to pay out futures bets placed on any team. FanDuel made every AAF bettor happy by declaring the 7-1 Orlando Apollos champions and paying out futures bets on them. However, the company decided to also grade all futures bets on the other seven AAF teams as winners, including the Memphis Express and Atlanta Legends — two teams that had been eliminated from playoff contention. “Because the FanDuel Sportsbook loves football and we believe this is the very definition of a bad beat for sports fans everywhere, we are also going to pay out straight future wagers for all AAF teams as winners,” FanDuel declared in a statement. The North Carolina Senate passed a bill that would allow tribal casinos to offer legal sports betting in the state. The North Carolina Senate overwhelmingly passed a bill Tuesday that would allow casinos run by Native American tribes to offer betting on college and professional sports, as well as horse racing. The Eastern Band of Cherokee Indians, whose two western North Carolina casinos are the only ones in the state for now, would stand to benefit greatly if Senate Bill 154 eventually becomes law. “It is expected it will enhance the revenue of the tribe about $14 million a year, and that will yield about $1 million to the state,” said Sen. Jim Davis, a Republican who filed the bill and whose seven-county district includes the Cherokee reservation. A bipartisan bill was introduced in Ohio that would legalize sport betting in the state. Legislation co-sponsored by state Reps. Dave Greenspan, R-Westlake, and Brigid Kelly, D-Cincinnati, would allow the Ohio Lottery Commission administer sports betting and give the Casino Control Commission authority to investigate sports wagering. The bill also calls for a 10-percent tax to be applied to all sports betting and earmarked for education and gambling addiction programs. NHPR analyzed New Hampshire‘s sports betting bill that is moving through the state’s legislature. A U.S. Supreme Court ruling last year allowed states to legalize gambling on sporting events. Now the Granite State appears poised to do so, with a House bill advancing through the legislature. We look at the details of this proposal, which include allowing betting at 10 locations and mobile betting, as well as concerns around addiction and what some consider to be “government-sanctioned” gambling.